Excellent value, easy to use, cleans nicely. None to mention - might be too small for very large households - asides from that it's great! Looking to buy an unusual grill microwave? The Wellco WELMW202 may well fit that bill, being priced very reasonably and featuring an unusual white mirror finish complete with a 1000w grill built in. The Acrylic lining and mirrored finish mean that it is very easy to clean - a bonus for those accidental microwave spillages. The 800w microwave heats and cooks quickly and evenly - our baked potatoes turned out beautifully. In addition the 1000w grill finished off the food nicely, leaving a brown and crisp finish without being soggy - our test team were impressed. The capacity is 20 litres - inside the microwave accommodates a 25.5cm turntable, which should be large enough for the majority of dishes. The touch control panel was simple to use, and overall we were very impressed with this microwave - it offers excellent performance considering it's relatively low price tag. Overall the WELMW202 is a quirky looking grill microwave, which performs well and is easy to clean. It's pretty reasonably priced, and our test team enjoyed using it. 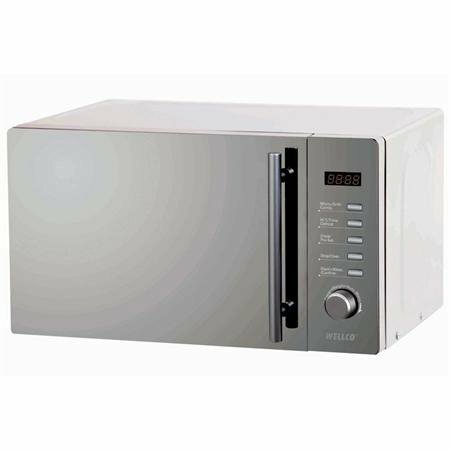 If you're after a cheap grill microwave, then the Wellco WELMW202 is well worth looking at.